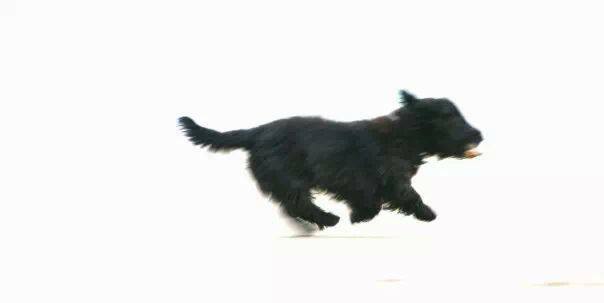 Very few of you, of course, were lucky enough to meet Caleb Alban, our Scottish terrier. And yet, in a way, you all know him – because Caleb was both our young dog and our old dog. Every time I was trying to think of a new sentence for the Welsh lessons, Caleb would be there somewhere – sitting under the desk, stalking a cat in the background, barking somewhere out in the garden – and there’s no doubt that’s why we have quite so many examples of young dogs and old dogs in the lessons (the cat stuff is really just an attempt at balance!). This post ought to be about last week’s remarkable Bootcamp, or about the imminent changes to our site design and social functions – but those will have to come later – right now, I need to write about Caleb, because after becoming suddenly extremely ill last Monday, he died on Tuesday morning, and Catrin and I are bereft. Grief is such a puzzling emotion. Why should it hurt more, at the moment, to think of Caleb than to think of my beloved stepfather Duncan, who died in 2001? Clearly the passing of time makes a difference – but there are days when the loss of Duncan still causes me pain, and Caleb was ‘just’ a dog. Maybe the time we give of ourselves is part of it – there are only four people in my life I’ve spent more time with than I spent with Caleb, and in the last ten years Catrin is the only one (and that by a hair’s breadth!). And yet I was devastated when I heard of the death in a car crash of one of my secondary school students, Stuart, and I hadn’t seen him at all for almost five years. Maybe, all variables to one side, it’s just the horror of being confronted with a reality that we cannot change. Life is a process of change, and the more we can control that change (by and large) the better we feel. Everything else that hurt Caleb, we dealt with – whether that meant surgery for swallowed stones, clipping ingrowing dew claws, antibiotics for when he’d scratched himself raw – we got it done. Now, though, we can’t go back to the vet’s and reclaim his body and make him better; we can’t reach into these crystal clear memories of last week and carry him safely back into today; however much I can still feel him in my arms for those last two hours, I can’t press him to my heart and shake him back into life in time for one last summer. That powerlessness gives me a sense of horror – a sense, perhaps, of my own mortality, my own fragility in the face of that which can not be changed. But then again, maybe puzzling about it all is a waste of time. Even if I knew what the chemical fluctuations are that cause this tightening in my chest, and this raw pain in my throat, the feelings probably wouldn’t disappear (although having said that, there is interesting evidence that even just naming a feeling can help us control how we respond to it). Perhaps all we can do is live through this pain, work out our own rituals and farewells, hold each other’s hands and wait for time to turn these memories into the stuff of happiness. I could talk to you forever of Caleb. My family has kept dogs all my life, but I’ve never loved a dog the way I loved Caleb. I could tell you of every odd little skip of his left hind leg on our walks, every branch or root or stone he’d sniff, the little love sound in his throat when I stroked him, his not-quite-willing-to-sit before getting food, the way he’d spin round when I made little circles with my finger – all the million details of a life shared for ten joyful years. 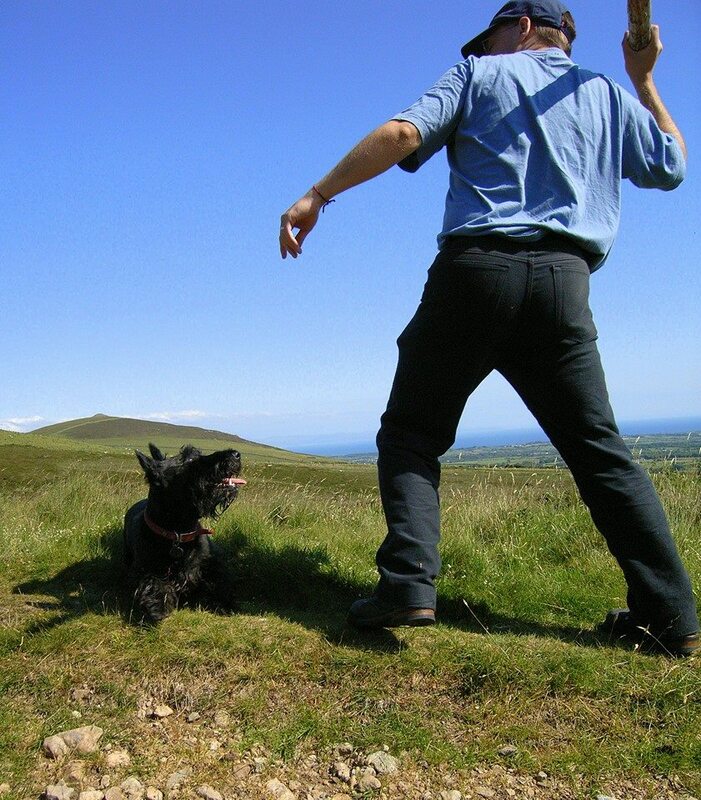 A beautifully written piece on grief, prompted by the loss of a much-loved canine companion. Something I wholeheartedly empathize with, sadly. Thank you for your very kind comments, and I’m sorry for your loss. Lovely blog post. Nos da Caleb. Hen gi bythgofiadwy. Nos da Caleb. Pets are unique. Even though we have Caoimhe, our British Shorthair, I still mourn the loss of our first BSH Maebh – even with the passing of 2 years. They can leave an indelible mark, and grief is a curious thing. Thank you for posting this, and I wish you well as you grieve and heal. Thank you for your kind words and understanding, Diane. Doedd gen i ddim geiriau wythnos diwetha a dal gen i ddim geiriau rwan. Dan ni’n cofio am byth mynd â fo am dro olaf dydd Sul. Diolch o galon i ti, Ger. Really sorry to hear this and only dog people know how it feels. I ran the equivalent of the distance from here to Japan and half way back with my previous dog. I spent most hours waking and sleeping with that dpg. And he was my all time favourite but it doesn’t mean I love Soot ap Mac any less, Somewhere there’ll be another hairy mate who’ll love being y hen gi. Dal i gredu. I have beautiful memories of being woken by Caleb at about 3 in the morning and being asked by him to play. After having met me only the evening before he had decided I was worthy enough. Amazing! Diolch Caleb, cysga’n dawel, hogyn da. Nos Da Caleb. I enjoyed learning Welsh with you. Diolch yn fawr iawn, Andy – mae hynny’n meddwl llawer i mi. We are privileged to share our lives with our special animal companions. Their love is pure. When we lose them, it is like a part of our lives has been ripped out from our hearts and the pain can be unbearable. But I know from experience that the treasured memories of time spent together will sustain you in the future. You will be able to smile at the fond memories rather than feel like crying. Our friends stay in our hearts and the joy they had during their brief stay with us will be a comfort and a warm memory given time. Nos da Caleb, wnest ti garu ac oeddet ti’n caru. Diolch yn fawr iawn i ti, Stu, a diolch o galon am dy gefnogaeth a chynsyrn yn ystod yr wythnos. Nos da Caleb, oedd e fraint i fi y dod gyda ti ar dy dro olaf, cysgu yn dawel nawr. Wnei dy byw am byth yn ein calon. Diolch o galon i ti am bob dim, Vaughan. Nos Da Caleb. I work at a Vets and every pet that goes leaves a huge gap in the family. They are always there when you need them, un judgemental and love you for who you are. Remember all the happy times you have shared with Caleb and the you will heal. Cysgu yn dda Caleb. Diolch yn fawr, Lynda. That must be a really tough part of the job – thank you for your work. Remembering the young/old dog from course one with great fondness. Stu is right – animals love with a pure heart and that’s something that will stay with you and your family forever. Diolch yn fawr iawn – yes, couldn’t agree more. Aran, this was so beautifully written I had to share it with Joe. I feel honored to have shared a last walk with Caleb. We send love and healing to your grieving hearts. And to Caleb, Nos Da bach. Diolch o waelod calon i ti, Jen. Aran, I did not ever get to know your little dog, but I sorrow for your loss nonetheless. I have never been any good at the deaths of our pets, so much they become members of the family. We must cling to what comfort we can find. Cofiwch…Mae’r gi yn gallu mynd i’r nefoedd hefyd. Morgan, diolch yn fawr iawn for that – greatly appreciated.